Understand what your company is all about. You should have a solid understanding of your business’s vision and values before you do any hiring. Why would someone want to work for you? What types of people do well in your company? Where would you like to see your business go in the future? Understanding these ideas helps you to get a better sense of the kind of candidate you’re looking for. You should have a general idea of the kind of person you’re hoping to hire when you begin the interview process. While you can be flexible on certain things, you want to be sure that the candidate’s training, vision, and attitude are in sync with the rest of your office. When new hires are able to blend in well, it keeps the company feeling cohesive. Break free from generic interview questions. If you’re still asking candidates where they want to be in five years, then you’re partly to blame for bad hires. By asking cliché interview questions, you don’t give candidates a chance to really show their personality to you. As a result, you’re making a hiring decision based on limited information or canned answers that the interviewee has gotten highly accustomed to delivering. Get innovative with your inquiries. Ask questions that are actually relevant to your company and your industry. Yes, it’s time consuming, but checking professional references is an extremely important part of the hiring process. Even if you need to fill the role quickly, don’t skip this step. Don’t get so caught up in a timeline. Having an open position within an office can put a strain on your other employees. However when you rush and throw in someone new just to fill the job, they may not end up being a great fit. Instead, be thorough as you go about the interview process. This way when you do end up making a decision, you can help ensure that this individual will stick around for the long haul. 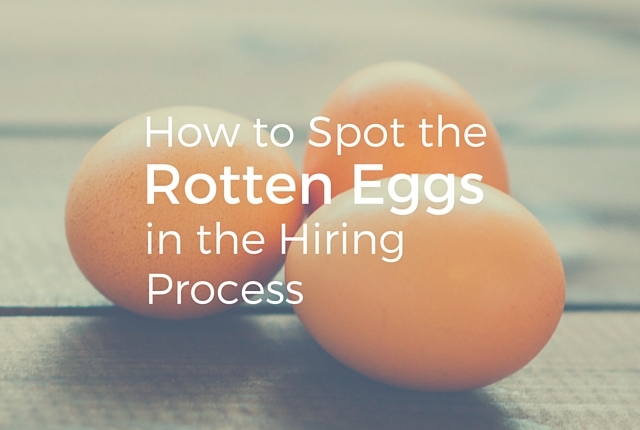 How do you spot bad hires? Share your tips with us in the comments!